The quarter (short for "quarter dollar") is a U.S. coin with a denomination worth 25 cents, or 1/4 of a U.S. dollar. Formally it is known as a "quarter dollar." It has a diameter of 24.26mm (0.955 inches) and a nominal thickness of 1.75mm (0.069 inches). Quarters that are currently minted for circulation by The United States Mint are composed of outer layers of 75% copper and 25% nickel, with a core of pure copper. Individual coins minted explicitly for coin collectors can consist of the copper-nickel alloy or a distinctive combination of 90% silver and 10% copper. The United States quarter dollar was authorized by the Mint Act of April 2, 1792. Although the United States Mint could have started producing them immediately, the U.S. Mint did not mint the first quarter until 1796. At that time the United States Mint did not produce coins on its own accord. It waited for citizens to deposit bulk silver bullion and then make specific coins to order at the request of the depositor. The mint kept a small percentage of the deposit to cover its cost of manufacturing the coins. The first quarter dollars produced in 1796 featured the Draped Bust design on the obverse with a small eagle on the reverse. Normally, the mint usually provides a large number of coins in the first year of issue, but only 6,146 coins were produced that year. It wasn't until 1804 when the mint produced quarters again but this time with a heraldic eagle on the reverse. In 1815 the design was changed John Reich's rendition of the Capped Bust quarter. Production was intermittent during this time and mintage figures varied. In 1838 the quarter's design was changed to Christian Gobrecht's Liberty Seated motif. Although the mint implemented several minor design changes over the years, production was entirely consistent until it was last produced in 1874. The only exception during this time frame was the period during the Civil War. Charles E. Barber's Liberty Head quarter began its production run in 1892. These coins were continuously made through 1916 when a sweeping revision of almost all United States coinage took place. This series of changes led to the classic Standing Liberty quarter designed by Herman A. MacNeil that began in the latter part of 1916. The first Standing Liberty quarters produced featured a likeness of Lady Liberty holding a shield with her right breast exposed. Although numismatic scholars contest that some people objected to this design, it was further modified in 1917 to place a coat of chain mail on Lady Liberty. In 1932 the Washington quarter made its debut as a commemorative coin. Although the United States was in the throes of a depression, people gladly accepted this new coin design. Because of the Great Depression, no quarters were produced in 1933. However, when production resumed in 1934, the U.S. Treasury Department decided to keep using the commemorative Washington design as a regular circulating coin. Since then, United States quarters have featured George Washington on the obverse. In 1976 a circulating commemorative coin for the United States Bicentennial was featured. 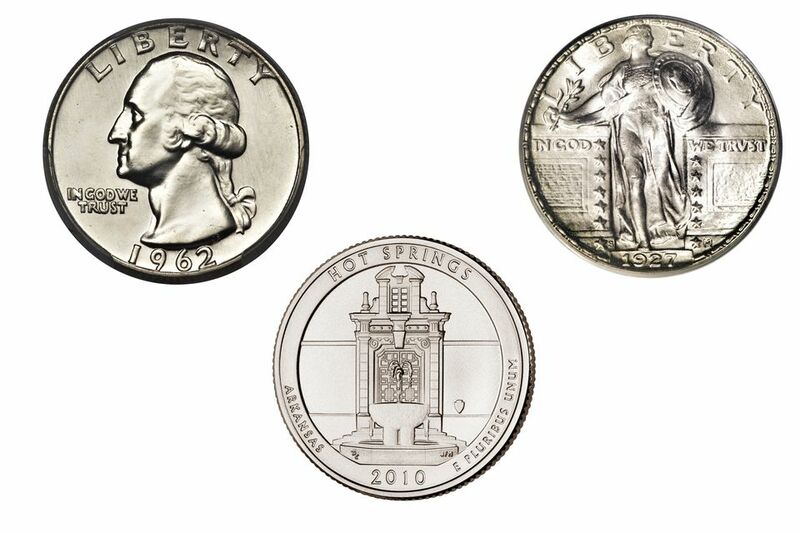 In 1999 the 50 State Quarters Program began and in 2010 the America the Beautiful Quarters Program took over. The largest coin ever made by the United States Mint is the America the Beautiful Silver Bullion Quarter. Although this coin has a face value of twenty-five cents, it is composed of five troy ounces of .999 pure silver. It was never intended to circulate as a quarter, but to be sold to coin collectors and investors who want to buy silver bullion.